The Lenovo Yoga Book is not another boring Windows laptop. This Windows PC (and its Android-based sibling) is both a convertible notebook with a 360-degree display that flips into a tablet and it replaces the traditional physical keyboard with an innovative multi-touch surface with an integrated Wacom drawing pad. Is this Windows-based notebook any better than the lackluster Android version? Will the operating system even matter to most people? Keep reading to find out. 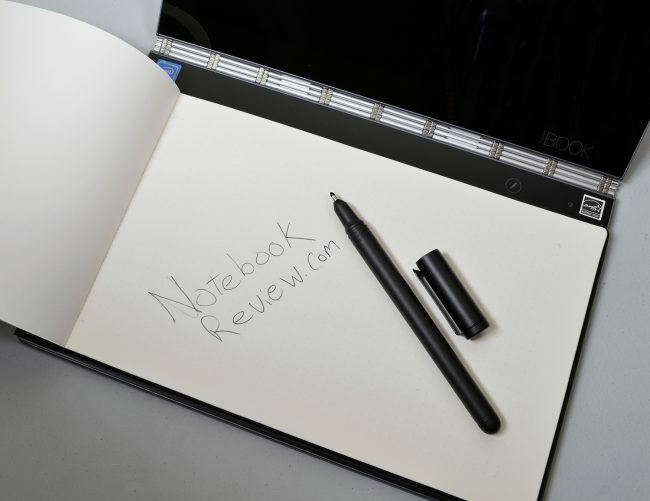 Editor’s Note: Be sure to check out our review of the Lenovo Yoga Book with Android since many of the comments below about design, port layout, screen and keyboard will mirror our earlier review. The Lenovo Yoga Book with Windows gives the Microsoft Surface a run for the best hardware on the market. This thing looks and feels great. It measures 10.1 x 6.72 x .38 inches, and weighs 1.52 pounds. It has a traditional clam-shell design, with Lenovo’s excellent Watchband hinge for distinction. With its magnesium alloy casing, Lenovo Yoga Book looks like a high-end binder when closed and will probably look right at home in a televised courtroom drama or the next feature film about young, attractive hackers. It’s the stylish Watchband hinge that offers smooth and consistent resistance when opening and closing the Yoga Book. Combined with the device’s superb balance and weight distribution, the hinge enables the Yoga Book to prop open at literally any angle, from one to 360 degrees. Lenovo calls it a Halo keyboard, and while it looks amazing it feels like a poor substitute for the real thing. Typing on it is slow and clumsy. Without physical keys, you’re left tapping blindly where you think the key should be. That’s good enough to accurately type letters with some practice and concentration, but awkward with the smaller punctuation keys and Shift-key combos. Touch typing is impossible, and pecking away with index fingers is only slightly better than the on-screen alternative. Press the pen icon on the keyboard panel and the key icons disappear, revealing the Wacom-powered Create Pad. In contrast to the Halo keyboard, this is an excellent setup, with the Yoga Book’s lower half acting like a more traditional Wacom tablet — the kind photographers and digital artists use. It supports the Wacom Real Pen’s 2048 points of pressure sensitivity. The Yoga Book has a 10.1-inch IPS display with a 1920 x 1200 resolution, with an advertised 400-nit brightness. We measured the maximum brightness from the display in our review unit at just 382 nits with an average of 351 nits, so we’re not sure if our display was just a bad sample or if the maximum brightness is actually closer to 350 nits. Either way, the screen is gorgeous with sharp details. The 224 pixels per inch from this screen is virtually indistinguishable from the 264 pixels per inch in Apple’s iPad Pro models. The color accuracy is first rate and looks fabulous indoors. Unfortunately, and high-gloss screen surface makes it almost impossible to see the screen outdoors under bright sunlight. This is a Lenovo AnyPen display, meaning it registers any metal or graphite point as a touch input. It doesn’t offer pressure sensitivity or other advanced active stylus features, just a more precise means to tap and swipe. This is more useful in Windows, where precision touch is sometimes required, than Android. Without AnyPen, the Real Pen stylus is useless on the display. And that’s because Lenovo placed the Wacom digitizer tech in the Yoga Book’s bottom portion, along with the Halo keyboard. The maximum brightness of the display in our review unit measured 341 nits. The Yoga Book might look and feel like a premium notebook on par with the Apple MacBook, but the quad-core Intel Atom X5-Z8550 processor (1.44 GHz, 2.40 GHz burst, 2M cache) inside the Lenovo Yoga Book means you can’t expect premium performance. Granted, the starting price for the Yoga Book with Windows is just $549.99 at the time of this writing and a 2.4 GHz Intel Atom processor is reasonable at that price point given all the extra features that the Yoga Book delivers. There’s no room for a traditional spinning HDD inside this thin and light laptop, so the Yoga Book relies on a 64GB SSD based on eMMC flash memory. You can expand the internal storage up to a total of 128GB by adding a 64GB microSD card to the built-in card slot. Unfortunately, the data transfer speeds from the built-in eMMC drive and the microSD card slot (less than 30 MBps) are pretty terrible by notebook PC standards. The built-in storage is fine compared to smartphones and tablets, but the Yoga Book needs a storage drive that competes with full-featured notebooks. The thermal management of the Yoga Book chassis proved to be quite good while the device is idle or just loading web pages. The external temperature of the chassis never exceeded 78 degrees Fahrenheit (26 degrees Celsius) during our testing and the maximum temperature under load (measured on the bottom of the chassis near the watchband hinge) was 104 degrees Fahrenheit (40 degrees Celsius). We recorded the maximum temperature after two hours of constant benchmark tests, so it’s unlikely that most owners would push the Yoga Book’s processor that hard. Lenovo’s official battery life claim for the Windows Yoga Book is “up to 13 hours” on a full charge. We ran the Yoga Book for 8 hours and 36 minutes of almost continuous web browsing and video streaming over Wi-Fi with the screen set to about 80% brightness before the battery was exhausted. It’s fair to say that if you want to get the advertised 13 hours of battery life you’ll need to drop the screen brightness down to minimal and probably shut off the Wi-Fi when you’re not using it. On the other hand, the USB power supply means you’ll be able to charge the Yoga Book from almost and USB-based charging station or power outlet with a USB adapter. Better with Windows … but not quite perfect. Still, the Halo keyboard is frustrating for touch typists or anyone who needs to type a lengthy document. We likewise found it frustrating that the pressure sensitivity and advanced Wacom functions of the Real Pen only work on the Create Pad and not the display. While we’re talking about missing features, let’s not forget that the Android version of the Yoga Book lets you record notes with the screen off … something this Windows device can’t do. Whether or not the Windows version of the Lenovo Yoga Book is right for you depends entirely on how you plan to use it. If you just want a lightweight Windows laptop for daily, casual use and don’t regularly need to digitize sketches or handwritten notes then there are less expensive notebooks on the market with better performance. If you want a secondary device for sketches and notes that’s better than an Android tablet or the Apple iPad Air 2 and arguably better than an iPad Pro then the Yoga Book makes perfect sense. The bottom line is that the Windows version of the Yoga Book is better than the Android version of the Yoga Book, but neither of these devices are ideal for daily use primary PCs unless you do more writing and sketching than anything else. Halo Keyboard doesn’t feel great when typing – I am not a typist; so, I may not care much in this regard. If this keyboard lets me type with my current (slow) speed, I am okay with that. Real Pen doesn’t offer full functionality on the screen – Next edition, and it should be fixed. Mediocre performance – They need to replace the Atom with a Kabi Lake ULV CPU, and things will dramatically improve. Replace it Lenovo, I am waiting for it! @LeeHammond — We also reviewed the Android Yoga Book. TLDR version: Android is not suited as a desktop OS, and it hasn’t incorporated inking workflows as well as Windows. That’s why this is the superior version.